You can taste the texture of kombu pickled directly and the authentic flavor of dashi of shavings bonito. Asazuke also has less salt. and the authentic flavor of dashi of shavings bonito. Asazuke also has less salt. Why don't you eat many vegetables as like a salad? kombu, sugar, vinegar, shavings bonito, and light-colored soy sauce. Wash vegetables well and drain water. Cut kombu into 2 cm and put them into bowl with vegetables. When it becomes soft, mix the ginger, sugar, and vinegar. Pour them to pickling container or plastic bag. Place a weight on it and leave it for about 2 hours. Just before eating, add shavings bonito and a little soy sauce to taste. 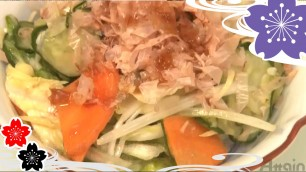 ✍You can eat many vegetables on season and even remained vegetables as Asazuke. add soy sauce just before eating and you can also enjoy the changing of flavor.